Power(s) given Fly for a while, attract Flipbugs, stick to Honeycomb Wall‎s, land on Flowers and clouds. 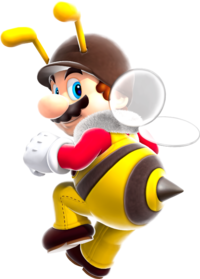 Bee Mario is a form that Mario and Luigi take after obtaining a Bee Mushroom in Super Mario Galaxy and Super Mario Galaxy 2. When Mario takes this form, his hat becomes a brown helmet with yellow antennae, his overalls turn yellow with brown stripes, his shoes turn reddish-brown (Luigi's color scheme is reversed from this. ), and he grows a stinger (though it cannot damage enemies and is simply for decoration) and small wings, which allow Mario to take flight in a similar manner to a bee for a short time. When Mario flies, his fly gauge will decrease unless he refills it by collecting coins, clinging to honeycombs, or landing. The fastest way to refill the gauge while flying is to stomp on enemies. Mario is also able to climb honeycombs and walk on flower petals and clouds. Mario will lose this form by taking damage or touching water. Bee Mario is unable to hit ? Blocks, use advanced jump moves, and pick up shells. Also, his Spin radius will become smaller and honey with a yellow trail will replace the regular blue cosmic-looking spin trail. Bee Mario (and Bee Luigi) can be used in the Honeyhive Galaxy, the Gold Leaf Galaxy, the Sea Slide Galaxy, the Sand Spiral Galaxy, and the Honeyclimb Galaxy. This ability returns in Super Mario Galaxy 2, only usable in Honeybloom Galaxy, Honeyhop Galaxy, and in the game's credits after collecting 120 stars. Bee Mario also appears as a costume in Mario & Sonic at the Olympic Winter Games. To get the costume, the player needs to get to the Secret Store and buy the Black Shopping Card. The same costume appears in Mario & Sonic at the London 2012 Olympic Games, Mario & Sonic at the Sochi 2014 Olympic Winter Games and Mario & Sonic at the Rio 2016 Olympic Games. In Mario Tennis Open, a Bee Mario racket and a Bee Mario costume can be unlocked. The costume is obtained by giving eight characters a star rank, while the racket randomly appears in the shop after a tennis match and can be purchased for 1,300 coins for Miis to use. In Mario Golf: World Tour, a Bee Mario costume, Bee Mario golf ball, and Bee Mario golf club set can be unlocked. The golf ball and clubs appear in the shop after playing rounds, and the costume becomes available when the player succeeds 20 times in Endless Shot Practice. Wii Super Mario Galaxy 2 (5/2010) Do you hear that buzzing? Whatever could it...bee? Bee Mario! Finding a Bee Mushroom allows Mario to buzz around in the air, land on flowers, and stick to walls covered in honey. Oh, this is the bee's knees! However, Bee Mario can't sting his foes. But that's fine–you don't really want to be that kind of bee, do you? One contest on the Check Mii Out Channel was a Mii Contest where players had to create Bee Mario. When in Bee Mario form, if Mario is behind an object, his shadow isn't in the shape of Bee Mario, but as normal Mario. This applies with all of Mario's forms in the Super Mario Galaxy games. It is possible for Bee Mario to be underwater, due to a glitch in the Sea Slide Galaxy. In the Super Mario Mash-Up Pack in Minecraft, Gold Armor is replaced by a Bee Suit. Bee Mario has a stinger, though in the real world only female bees have one. This page was last edited on March 13, 2019, at 00:14.